The UWM Archaeological Field School will be held at the Aztalan site in Jefferson County, Wisconsin. Aztalan is one of the most significant archaeological sites in the Midwest and UWM has a long history of research at the site. Students will learn to excavate, record, and interpret multiple occupation levels at the site through a field-based, hands-on practicum. The 2019 WAS Winter Dinner will be held on January 19. Social hour begins at 5:00 pm with cash bar, appetizers, and coffee. Buffet dinner with salads, vegetables, starches and four entrees begins around 6:00 pm. This year's featured speaker is Dr. Thomas Loebel. RSVP deadline in January 12, 2019. Please see the event page for more details including payment options. The Wisconsin Archeological Society (Society) would like to thank everyone that participated in the Society’s 2018 Board Member Elections. The 2018 Wisconsin Archeological Society Board of Director Elections will begin on Monday October 1st. All current Society members are asked to participate in the elections by casting your vote. The Society is using a free internet voting site called ballotbin.com to reach as many members as possible. Members will receive a notification letter from ballotbin.com that provides a personalized registration code. Please watch from the notification letter in your email inbox. If you do not see it in your inbox, please check your junk folder. Members are allowed vote at any time between 12 AM on October 1st to 11:59 PM on October 31st. George W. Christiansen III has been nominated to fill the position of President of the Wisconsin Archeological Society to serve from January 2019 to December 2020. George is a professional archaeologist with over 30 years of experience in the pre- and post-contact archaeology of the Upper Great Lakes. He currently is a senior lecturer at University of Wisconsin – Platteville Baraboo Sauk County in the Department of Social Sciences and is also the Director of the Center for Wisconsin Archaeology. George has been a member of the Wisconsin Archeological Society for over 20 years and is near completing a two-year term as an At-Large Director on the Wisconsin Archeological Society Board of Directors. If elected, his primary goal will be to promote education of the general public about Wisconsin’s unique cultural heritage. He believes that this can only be accomplished by expansion of the WAS membership and providing the public opportunities to become involved in Wisconsin archaeology through WAS sponsored lectures, publications and hands-on experiences. Rob Nurre has had a varied career working primarily in education, interpretation and preservation roles involved with both natural and cultural landscapes. Over a period of almost 20 years he was the Land Records Manager for the Wisconsin Board of Commissioners of Public Lands. In that role he was responsible for the working with many of the state’s original land records, particularly the field notes and plat maps of the original General Land Office Survey. These survey records were made available on-line based on his work. He also worked as a historical interpreter for the federal Bureau of Land Management during the 2003-2006 bicentennial commemoration of the Lewis and Clark expedition. Rob coordinated and provided the introduction for the 2001 re-publication of The Antiquities of Wisconsin by Increase A. Lapham, and is known to occasionally appear in character as Lapham and other figures from the past. For the past decade, Rob has been the volunteer caretaker of the Man Mound in Sauk County. Rob has been a member of the WAS for most of the past fifteen years. For about eight years he has been the chair of the WAS’s Preservation of Sites Committee focusing its efforts the society’s Heim Mound property in Middleton. He has served on the WAS Board of Directors since October 2015 and was selected by the WAS Board to fill the vacant position of Vice president in June 2018. Rob led the effort to revise the WAS by-laws which were recently adopted. Having been an organization for nearly 120 years, the Wisconsin Archeological Society has a deep and rich legacy of researching, documenting, educating about and caring for the archaeological resources of Wisconsin. The WAS needs to maintain its strong commitment to publishing The Wisconsin Archeologist while working to engage with a broader audience of people who have a more general interest in archaeology and the history of human interaction with Wisconsin’s landscape. We need to strengthen and reinvigorate our long standing efforts in the area of public programming through lectures, field experiences, hands-on experiences and publications for members and for the general public. We need to emphasize our cooperation with other vocational and avocational groups interested in archaeology and related fields of interest as we better define the important mission of the Wisconsin Archeological Society for the future. Cynthia (Cindi) Stiles has been nominated to the position of At-Large Director on the Wisconsin Archeological Society Board of Directors for a term from January 2019 to December 2020. Cindi has been professional archaeologist for 45 years, mostly in the Upper Midwest. For the past 25 years, she has worked in Northern Wisconsin primarily with the Wisconsin tribes. Once as the WHS Regional Program archaeologist in the northern portion of the state and now through her employment with Lac du Flambeau tribe, Cindi continues to give talks on archeology and work with landowners, avocational and student archaeologists, and others interested in the profession. She is also a member of the State Burial Sites Preservation Board. This is an exciting time for the Society and she would use her experience in the north and with the tribes to contribute to the Society's activities. Seth A. Schneider has been nominated to the position of At-Large Director on the Wisconsin Archeological Society Board of Directors for a term from January 2019 to December 2020. He has been working in the field of archaeology for over 20 years, and he became actively involved with the Wisconsin Archeological Society as the Program Chair in 2000. Currently, he has the pleasure of serving as the President of the Society. As president, he strove to set in motion more archeological events that the Society can provide members and public participants. Seth has been working with committees that are in the process of producing publications that provide updates on Wisconsin archaeology. As an at-large director, he plans to continue to work towards these endeavors and increasing the membership in the Society. If you have any questions, please email us at contact@wiarcheologicalsociety.org. 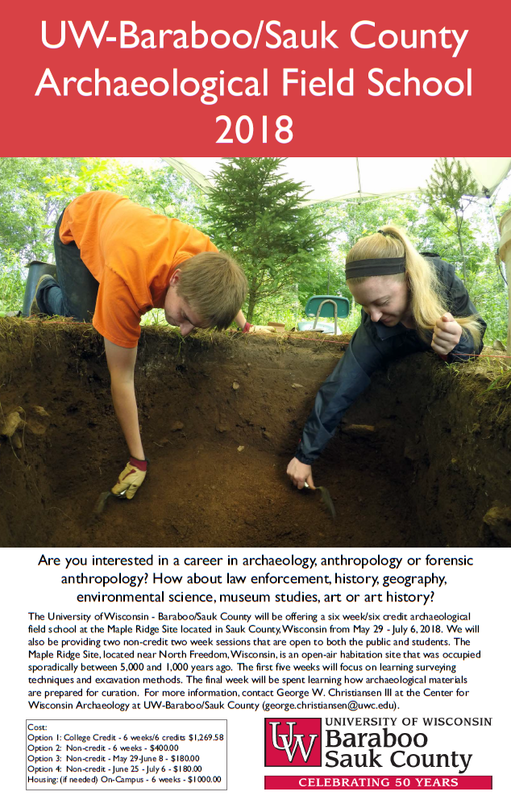 An upcoming Field School is being offered by UW-Baraboo/Sauk County. Both credit and non-credit options are available to those interested in attending. Please see the flyer or contact George W. Christiansen III (george.christiansen@uwc.edu) for more information.